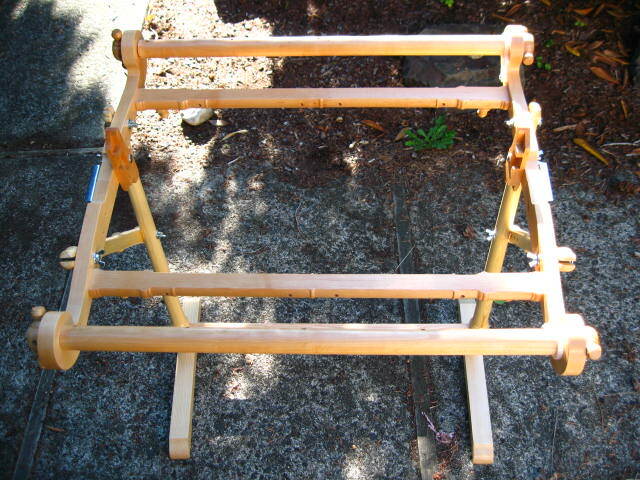 I recently snagged some table loom legs (with treddles!) 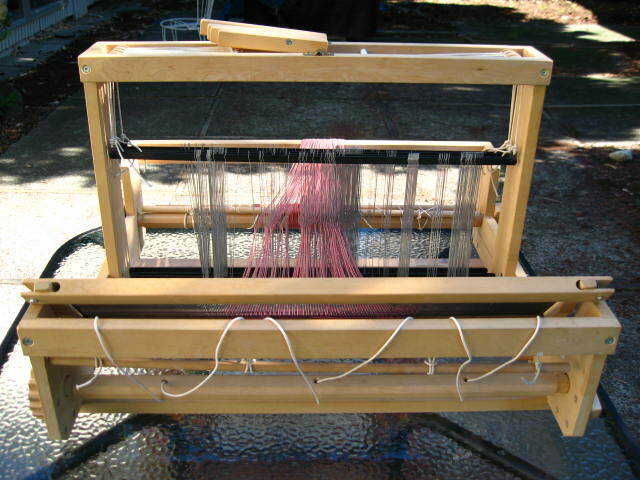 for Gil, my 25″ Rasmussen table loom. How? 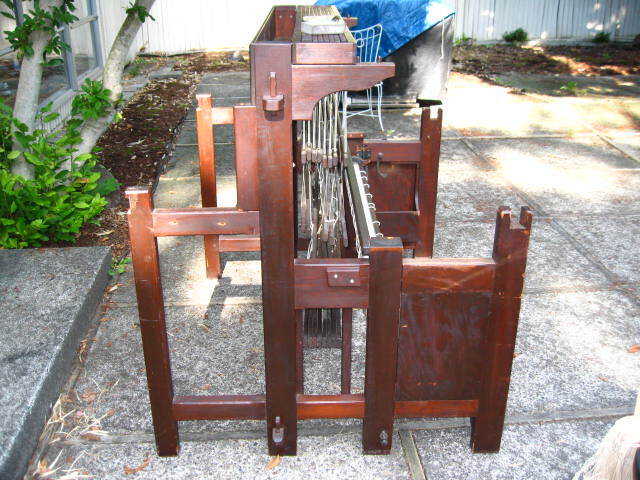 I purchased a second 25″ Rasmussen that came with a floor stand, took it apart, then re-sold the loom (the second, second-hand loom! 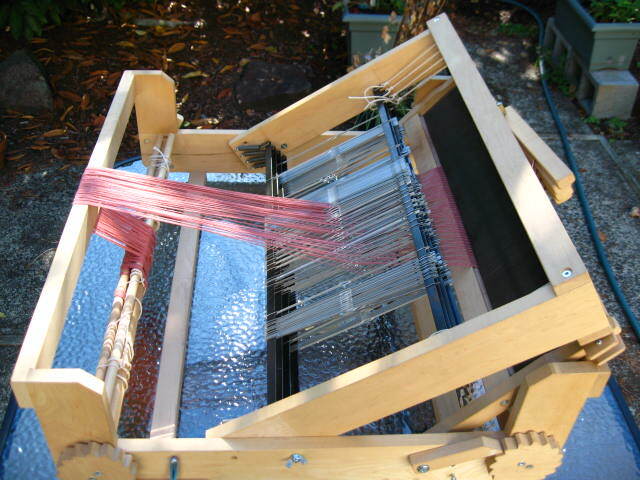 ), reserving the loom legs for Gil. 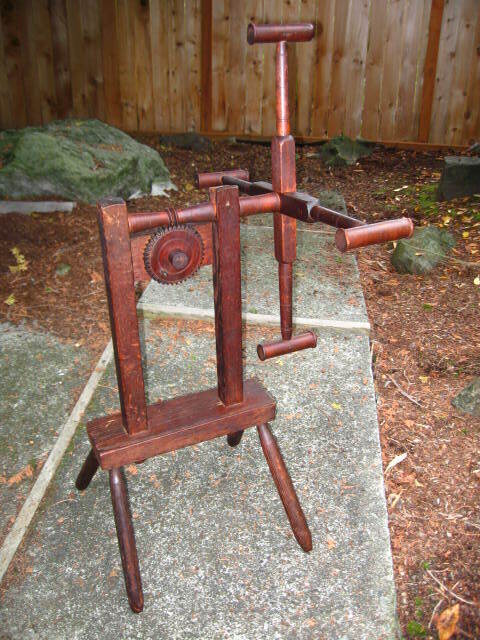 Somewhere in the midst of that, Gil and stand received a coat of tung oil. Whew! I kept Gil (even though he was older and had cotton rather than nylon tie-ups as did the newer one) because I had already installed new metal heddles on him and was not about to do any more fiddling with them. 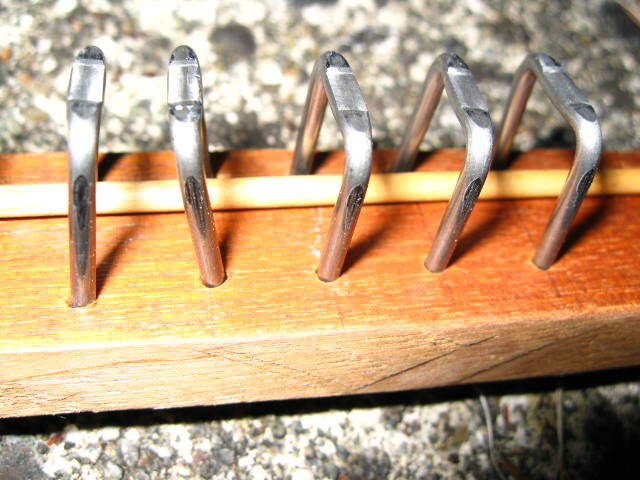 Before removing the second Rasmussen from its stand, I took careful notes on how the shafts were tied to the treddles. 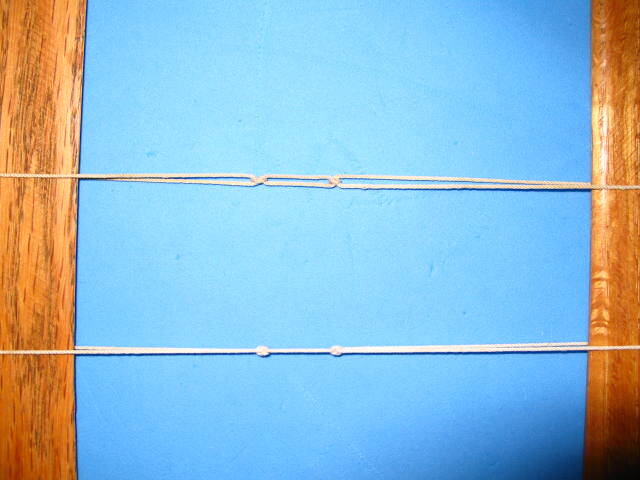 “Reverse engineering” taught me how to tie a lark’s head knot with only one available end. A lark’s head knot is basically two half-hitches tied in different directions. I’ve seen it called a snitch knot as well. 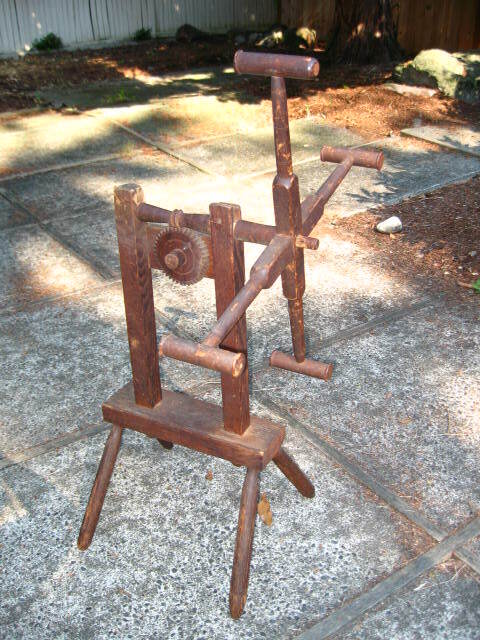 When it came time to attach Gil to the stand, tying up the first shaft and treddle took the longest time. I improved with the second, and even more in succession through the fourth, so I had to go back through to the fine-tune the first three. It was so much fun! 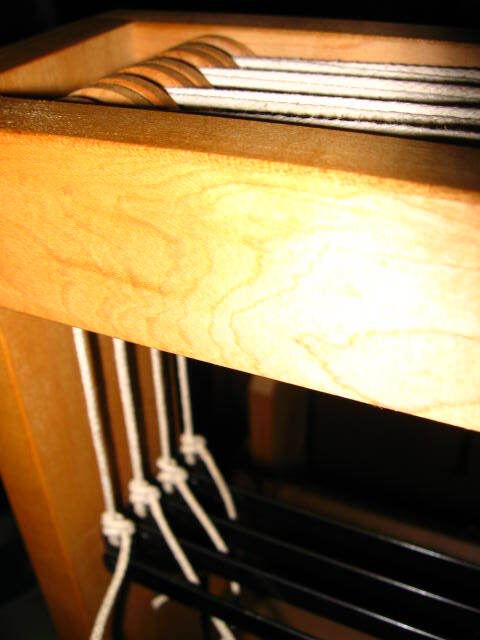 I learned so much about adjusting the cord lengths to balance the cords over length of the shafts so they were properly horizontal at the right height (high enough so the connecting springs did not dangle) while also being connected tightly to a treddle. I know it’s nowhere as difficult or intricate as a contremarche tie-up, but it was a fantastic stepping stone and warm-up exercise to it. I’m completely psyched to start on Beauty. 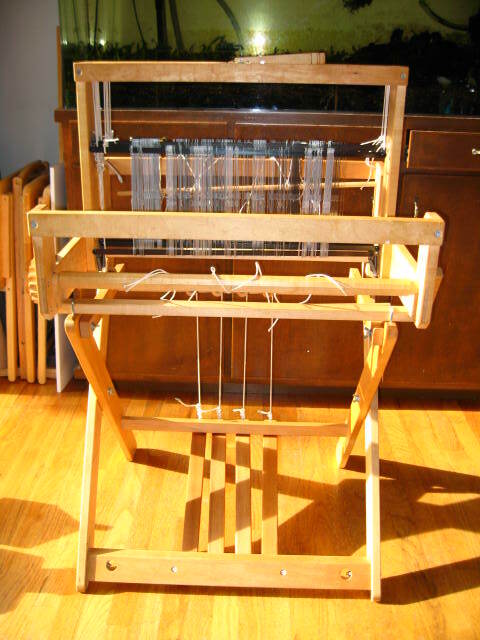 However, two things are in the way: string heddles, and loom cording. 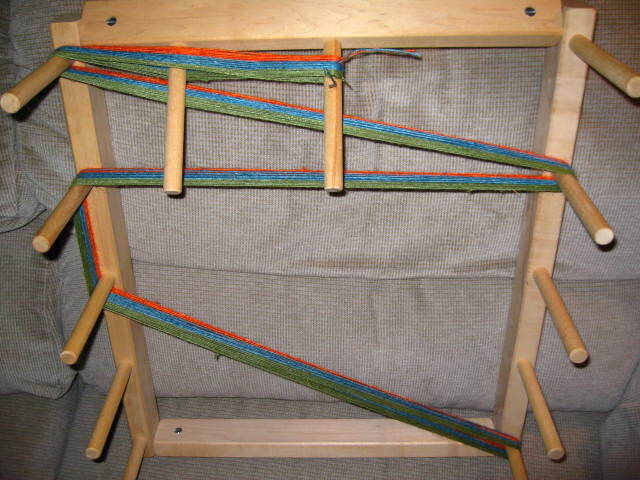 I’ve barely started with spinnng the loom cording. I’m not ready to surrender to buying texsolv yet. I have nothing against texsolv; well, perhaps my pocketbook does. 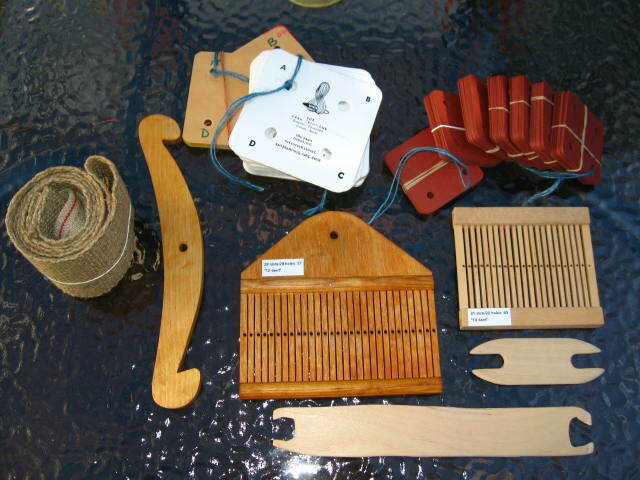 All my Bergman loom parts are original (pre-texsolv days), so I want to try to complete as much of it as possible in the same spirit. I’m looking forward to the spinning; I just have to curb my excitement about starting the tie-up until that is finished. 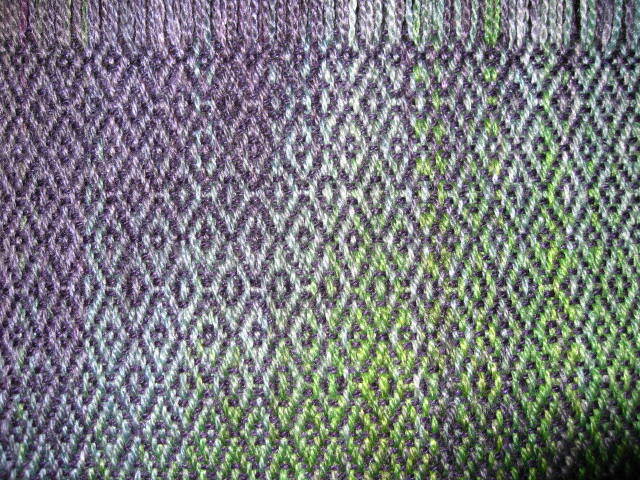 Then there are the heddles. After all the fuss about moving Beauty indoors, I had to cajole my DH into helping me take her back out — to polish and fix up her old wood parts. I couldn’t do it during the three long months she sat outside while I fretted about her not being inside and not being able to clear a space for her. I was too busy worrying myself into un-productivity. Finally, on one lovely day of summer reprieve last week, we moved Beauty outside, DH fixed some loose parts of Beauty’s bench, and I polished every exposed part of her wood. (I would have liked to coat the bottoms of her feet where they touch the ground as well, but it may have been asking a bit much of DH to have him do the lifting.) 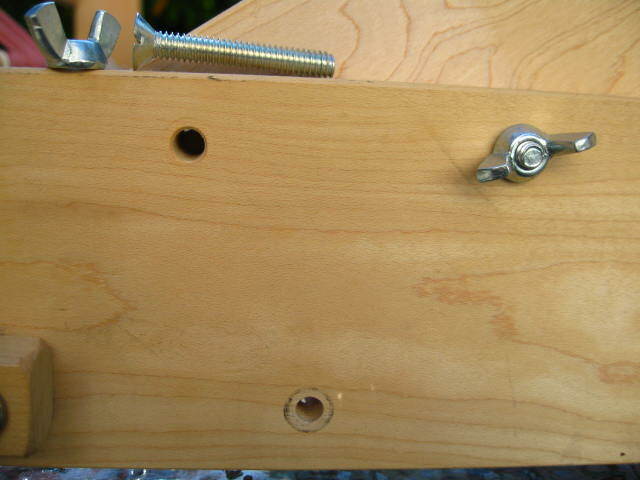 Both chi and tung oil have indeed been flowing in lavish abundance. Back to the string heddles. I removed (something like six hundred of) them from Beauty to attend to her shafts. On another productive day, I sat down to count and sort them. 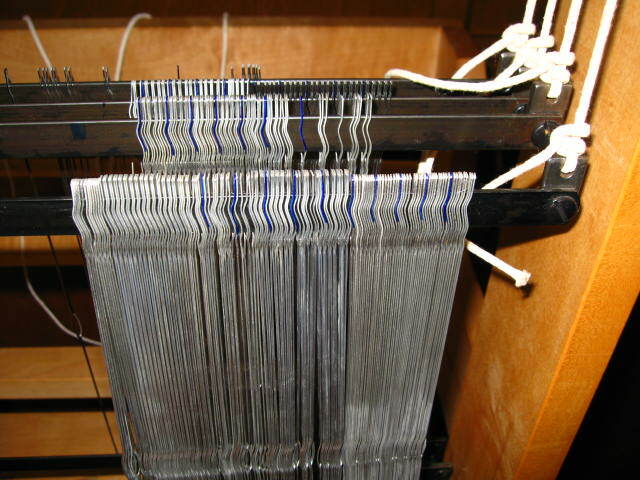 When I recently added more metal heddles to Gil, I noticed that the eyes were slightly twisted so the warp could pass through them in a back to front direction. 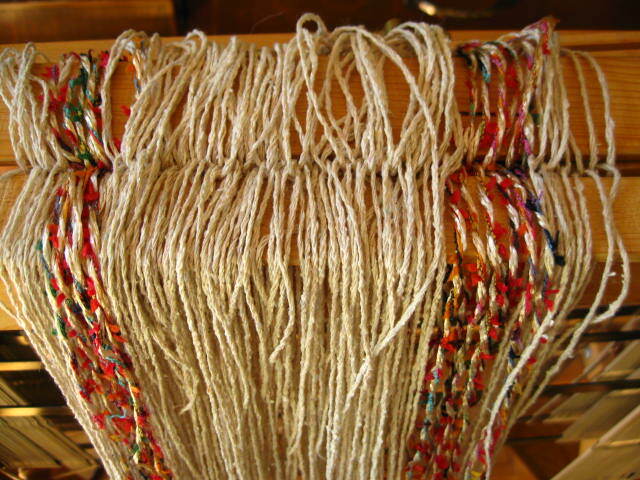 Working with string heddles, I noticed that adding one twist to them would make their eyes more open to the front. 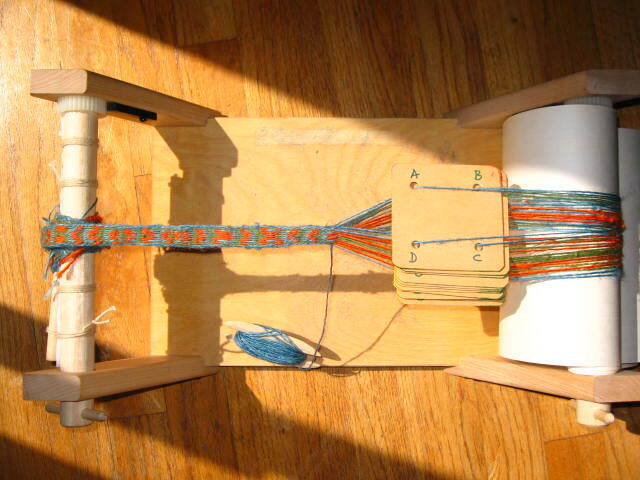 Doesn’t the top heddle (with twist added) look like the eye would abrade the warp less than the straight one below? Yes it’s a lot of work herding heddles!…In one weaving class, the teacher asked a student why she chose a particular structure for her project, and she said, “Because if I used this pattern I wouldn’t have to move any of my heddles from different shafts” Everyone laughed, and the teacher said that was a perfectly good reason. You do know you can tie them up into bunches (say, of 10, or whatever you like) when they’re on the loom, and move them together? Joanne Hall of the Elkhorn Mountain weaving site shows how. 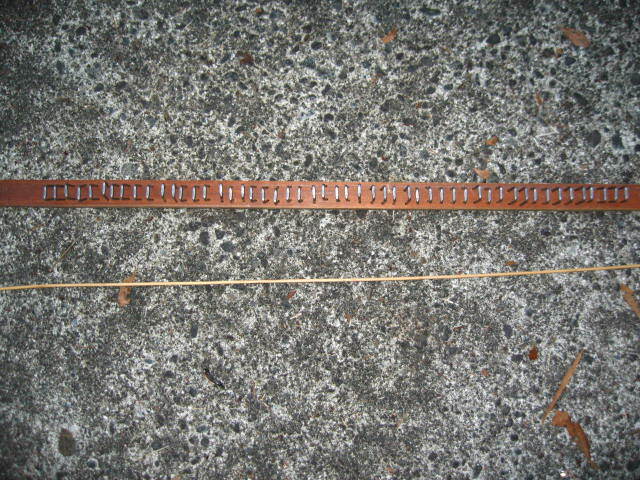 It’s a figure eight that goes through both upper and lower loops of the heddles. They’ll spread out just fine when you untie the groups, and it’s a good way to store them, so you know at a glance how many you have on hand. Oh, so glad you asked! The answer is no, there should not be a twist. 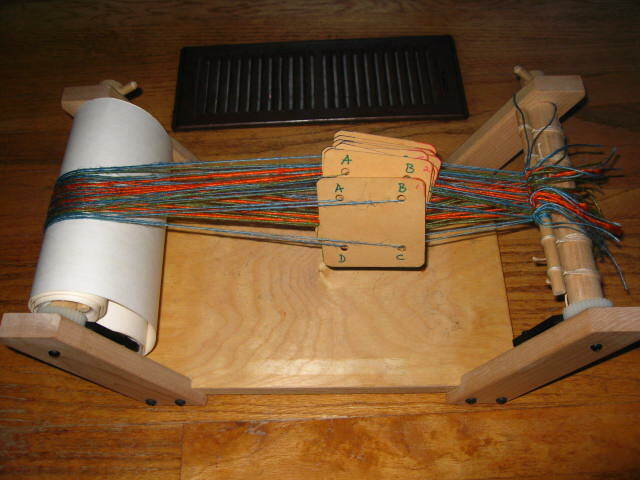 I put in a twist for my early string-heddle projects, because it does seem intuitive, doesn’t it? It’s kind of complicated and spatial to explain why not, but one of the reasons is that it will put more wear on your warp, even though it seems like the opposite would be true. 2. I don’t know my final count of heddles yet, but I’m thinking it’s about 800. Would you recommend loading them on evenly over the 8 shafts, or do you think I may need more on some than others? 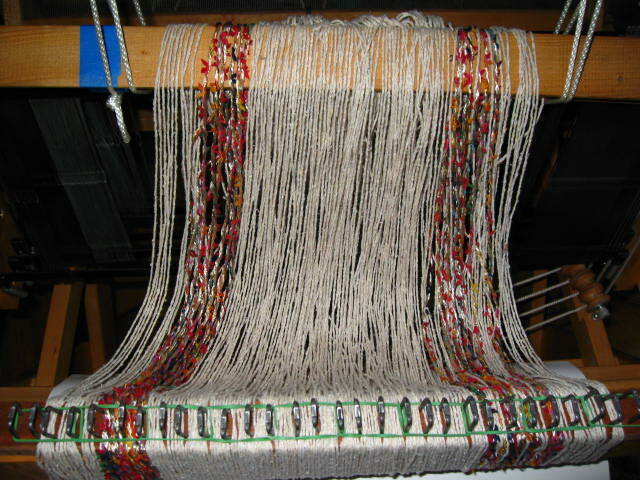 Putting the heddles on is such a pain, I would say don’t even bother loading them back on the shafts until you know how many threads wide your sample warp will be, then put exactly as many heddles on each shaft as the pattern calls for. 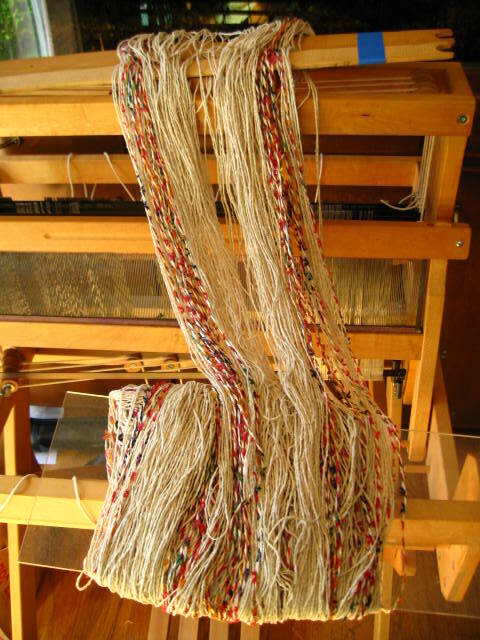 It’s not common practice to leave extra heddles on the shafts when you’re weaving with a countermarche. (I do sometimes because I’m lazy, but they can make the shafts heavier and get in the way.) 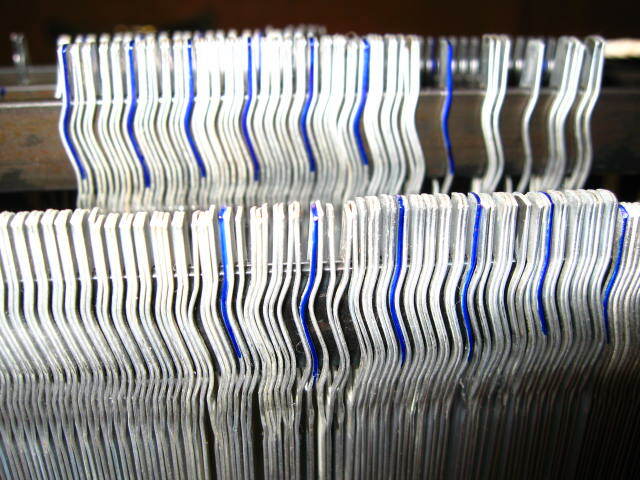 It’s a good idea to choose a pattern that requires roughly as many heddles on each shaft for your first warp. This is one of the things people mean by a “balanced” weave. Even countermarches can have balance problems, if one or two shafts are much heavier than the others (I speak from humbling experience.) There are tricks to help, but you don’t want to have to cope with that on your first warp! 3. 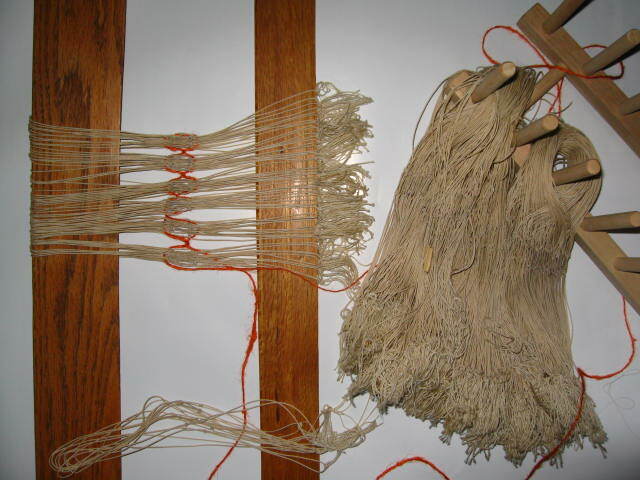 The heddles are all hand-tied string. 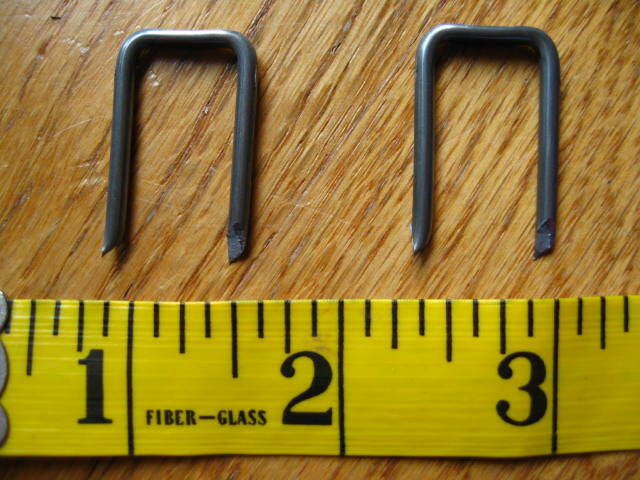 I would say that most of them are very similar, but I’ve come across more than a few where the bottom part of the eye of the heddles fall 1/8″ lower (or even more) than the others. 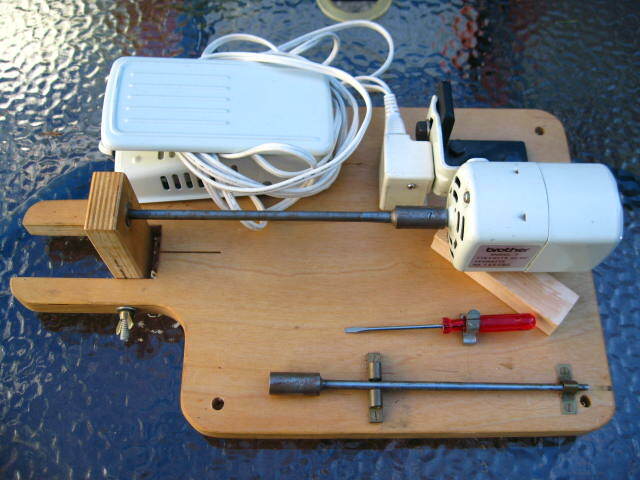 Is this significant enough to create problems in the sheds? 1/8″ probably isn’t too bad. More could be a problem. 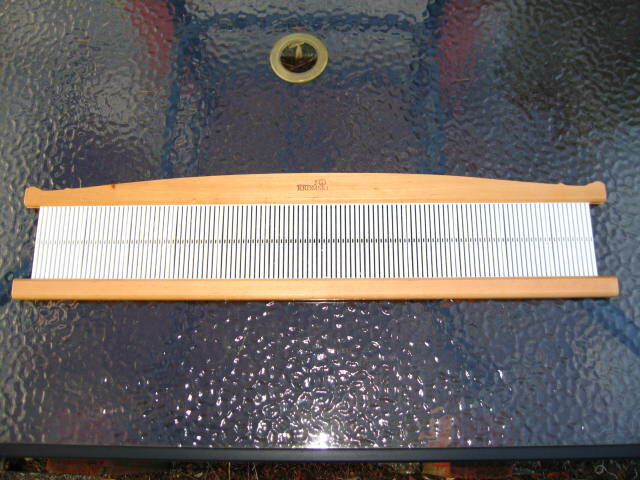 Perhaps you could sort out all the “good” heddles with 1/8″ tolerance, and put aside the baddies as extras. 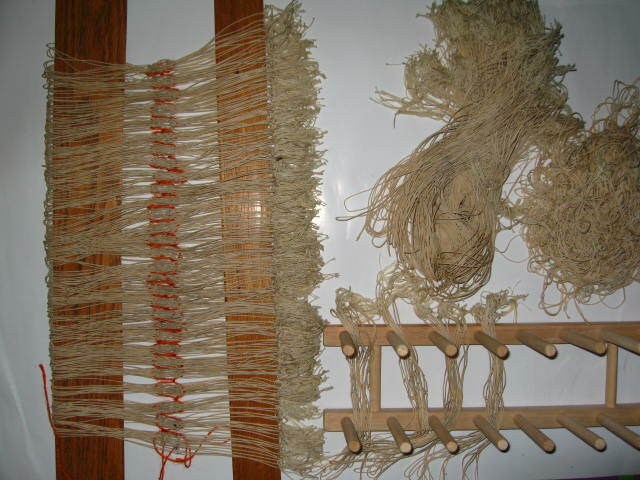 It’s more important that the top knot of the eye of each level with the others on the loom, more than the bottom knot, provided the heddles themselves are the same length. The top knot of the eye determines the height of the warp threads that get pulled down–the ones that your shuttle runs on top of. Thank You so much, Trapunto, for the generous help and advice! You are the Angel of the Bergmans!